Having trouble nailing down the most important concepts for the FINRA Series 24 Exam? Award-winning professor Karen Solomon will take you through the most heavily tested subjects in this online class. This recorded course will include lectures and problem-solving exercises. Lecture notes will be peppered with frequent example questions, similar to what you may see on the exam. This 10-hour video lecture goes over basic knowledge you will encounter on the exam. The videos are viewable on-demand for 180 days. 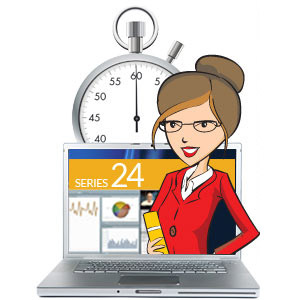 The Series 24 Video Lecture is viewable through our website and can be accessed via computer or mobile device. View a sample of the Video Lecture here. Interested in a live, online or on-site class? Read about our training programs here! I used Solomon Exam Prep for both the Series 7 and 63. Everyone learns differently, and they have resources for every type of learner. Their practice exams and quizzes push you to be prepared for the most difficult questions, enabling you to be over-prepared (better than the alternative!) for your exam. I received a 93% on the Series 7 and wish the regulators provided a score for the Series 63, but needless to say I passed. If I ever need to take a regulatory exam again, I will look to these guys first.